One of my recurrent wargaming nightmares is that I must to rebase all my miniatures to cope with a new ruleset. The last time that happened such thing was in 1996, when I changed from Empire to Napoleon's Battles and I don't want a similar experience with Lasalle. Luckily, Sam Mustafa gives advice about how to recycle miniatures based from other popular systems, including Napoleon's Battles (NB). Although I use a modified NB basing with slightly bigger bases than official, an arrangement required by my 20mm figures (see main web site), the Sam's guidance can still be followed. For infantry, my initial choice was one NB base equals to one Lasalle base. However, that leads to infantry units with only 16 miniatures, thus losing part of visual impact and joy of a tactical game. The solution is to use "virtual" Lasalle bases composed from one and half NB bases. The distortion is small as can be seen in the accompanying diagram, and only becomes apparent in the 'March column' formation that is longest (and more reallistic in my opinion). The Base Width (BW), the distance measurement unit in Lasalle, is thus 1.5" (3.75 or 4 cm). For cavalry and artillery the choice es simpler. Lasalle requires cavalry, artillery and infantry units with similar frontages, so this lead directly to the 1:1 ratio. In the case of cavalry, the only appreciable distortion is, as before, the greater length of the March column formation. The following diagram shows the cavalry system. The only drawback of the system is the small number of cavalry figures, eight, for unit but, according to Sam's own words, whereas infantry units in Lasalle represent 500-700 men battalions, cavalry units are "single, understrength regiments" of 300-500 men. Whereas this solution is perfect for competition games, using balanced armies, it could be a problem for historical Scenarios, but that is another question to be considered later. 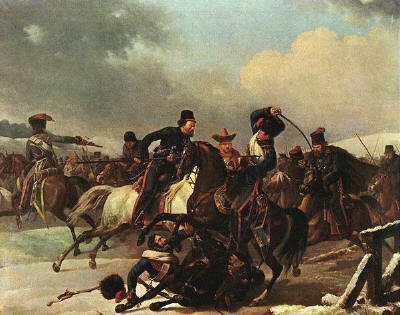 Irregular units (Cossacks, Kalmuks or Bashkirs) in Lasalle can not initiate combats against regular foes if if either of them is in open terrain. The reason behind, according to Sam Mustafa, is that these units were not used in formal battles, but only in pursuits, ambushes and the like. Their only utility is to add points in the 'Pursuit and Victory' step during the Army Morale Check and Victory (p. 67 of the rule-set) along other 'Pursuit' cavalry units like hussars, chasseurs, chevaux-legers and similar. During game play, the only use I found for the Cossacks is to use they to avoid the fall back of enemy units, placing them in the rear of the defending enemy. However, I think that these cavalrymen do not remained iddle during the battle, but were seeing always to make opportunist attacks against un-warned and surprised enemy units, such as march formation columns or convoys. 1) Irregular cavalry units may charge enemy units standing in 'limbered' or 'march column' formation in open terrain. 2) Irregular cavalry units must to pass a 'Discipline' test to initiate the charge. 3) If routed in 'decisive combat' the irregular cavalry unit is immediately broken. 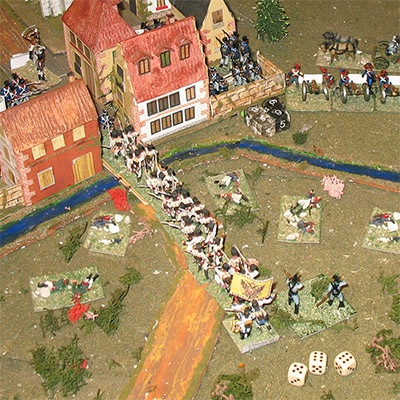 In Lasalle, the units in march column formation can not fire (although they can try to change formation) and halve their combat dice so they are potential targets for opportunist attacks. However, these attacks were not automatic -a discipline test is required- and were usually unsuccesful -the irregular unit risks its dispersion- but succeeded in occasions. I think that in this way the opportunist and volatile behavior of these units is well simulated. At a minimum they'll have a chance to see action! For historical scenarios, players may create wagons representing baggage trains, for one or both sides. They are a sort of “mobile objective marker” that must start in one location of the board, and either must remain there, or (depending upon the scenario) must be safely escorted to exit off a particular point on the board. - The wagon moves as if it were a foot artillery unit, always limbered. - The wagon neither fires nor can charge the enemy. It has only one formation: limber. It does not block line of sight or fire. It may not be fired upon. - Friendly units may move through it, as they move through a limbered artillery unit. - In its reaction phase, the wagon may attempt a Fall Back, as if it were a foot artillery limber. It succeeds on a roll of 4+, but if attacked by enemy cavalry, it must re-roll a success, even if within 1BW of friendly infantry. - If it fails to fall back, then the wagon is automatically captured in the ensuing combat. Combat must be “resolved” against it, as if against any other unit, but the resolution consists simply of removing the wagon, advancing the enemy unit(s) that captured it 2BW, and awarding the captured Objective to the enemy. - Any enemy unit that contacted the wagon suffers 1DISR, unless that would break it. (The men are dispersed, plundering the loot.) The unit must then take a discipline test. If it fails, it is marked in some way, showing that it is disordered and still plundering. - A unit that is still plundering is considered “Out of Command” for the entirety of its side’s next turn." 1) A march column can assault a defile like a bridge, a fortified gate, a fort, etc. It represents not only true march columns, but also all those formations with a very reduced front. 2) It fights at 1/2 dice and with no previous shooting, adding a -2 for "bad terrain" as they will be fighting in cramped quarters. 3) The enemy can use the "cover" or "higher elevation" modifiers when applicable.